Billy, the superhorse, also known as 'The Kid' by friends and as 'William' by me, was born and raised as naturally as it comes. He was part of a herd owned by a rancher in Northern Alberta who let his horses live the way horses are designed to live - free. Their 'paddock' was thousands of acres and their feed was whatever they could find growing naturally. They used trees for shelter and only saw humans when they were rounded up to be doctored, started, ridden or sold. Billy lived this life until his 2yo year when he was purchased as an untouched colt by my friend, former Parelli Instructor, Ron Knapp. Unfortunately for Ron (but great for me! ), Billy didn't end up getting as big as he had hoped, so after putting a month of training on him, consisting of a lot of rides in the mountains, he decided to sell him. Knowing that I was looking for a horse to replace my Level 3 mare who was not up to the physical challenges of Level 4, Ron contacted me and insisted that I come and take a look at this colt. He promised I would not be disappointed. He was right! I'll never forget the day I met Billy. I'd been looking for a horse that had colour, bloodlines, temperament, athletic ability and a play drive and I knew that I'd found it. There was something really special about this horse and it wasn't long before I understood exactly what it was. I don't know that I can describe it, but I've never had a horse with so much heart, who would turn himself inside out to figure out what you wanted him to do and who would never quit on you. I have owned Billy since 2002 and I can honestly say that I never dreamed that I could do the things that Billy and I can do today. And I never dreamed it could happen so fast! Even though I had graduated Level 3, I just didn't know that it was possible to be that connected, that light, that confident and that trusting in a horse that even after months apart I could walk out into a pasture, swing onto him without anything but my body to guide him and he would do anything I asked of him. That is true unity. In 2008, Billy suffered a severe setback when he broke the coffin bone in his hind hoof and had to undergo surgery to screw the two halves back together. It was a long, scary recovery and no expense was spared to save him. 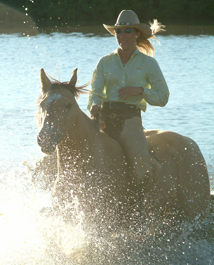 Then, in 2009, he suffered a massive injury to his back while sparring with a large gelding in the pasture. It took a long time for anyone to be able to diagnose what the problem was (2yrs), but he had become completely unrideable due to the extreme pain he was in. After months of body work and trying everything under the sun he was slowly able to be ridden again, but it was touchy. After finally getting a diagnosis of Kissing Spine (spinous process touching bone on bone) I decided to semi-retire him while I undertook the study of Legerete Dressage seriously so that I had the tools to bring him back. Four years later, you would never know he had kissing spine when I school him with Legerete! It is still my hope to get him into the 2-rein so we can finish our Vaquero Bridlehorse education, but in the meantime he's pretty cute in an english saddle. 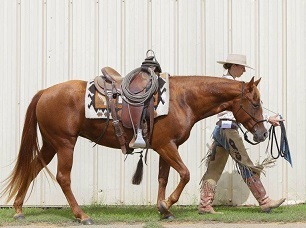 This special little horse is a daughter of the Legendary Wimpy's Little Step, a world champion reining stallion, and out of a performance mare successfully shown by Bruce Logan. Small but mighty, she has a HQ and personality that belies her 14.3hh stature. Although her natural talent is for reining, I have instead developed her exclusively using the Vaquero Bridlehorse methods passed down from Buck Brannaman. She was started late, at 5yo, and put on the backburner a bit when I first got her, so in 2015 I really gave her my focus. She's been hauled all over and used in clinics, so has had great exposure. Super sensitive and with a great mind and strong sense of dignity, we get along great! She's the perfect combination of level headed and light. Being reining bred, she has the typical conformation for that sport, so the challenge in making her into a bridle horse will be in getting her more elevated and light in the forehand. My studies in Legerete have really expanded on what I have learned over the years from Buck, in different words and different exercises, so I'm excited to sprinkle some of that in when the time is right. For now, she is still a Snaffle bit horse and just focusing on a rock solid foundation with her. I first met Summer when her owner brought her to a clinic in Ontario. I found some excuse to ride her and had a blast! Such movement and so lovely! When Summer's former owner decided to get out of horses, I jumped at the opportunity to acquire such a fantastic horse. She's one of the sweetest souls ever and loves people. Since owning Summer, many of my apprentices have had the opportunity to ride her when they came to study with me or when they needed a horse to use to ride with Linda Parelli. She quickly became the horse that Linda recommended Instructors ask me if they could borrow as she's just so keen and willing. If I could clone her, I would! 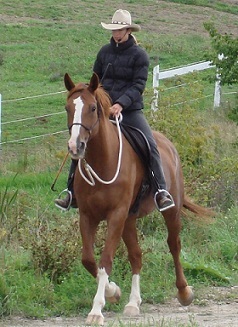 Summer is awarmblood and stands at around 17.1hh. She was raised as a jumper prior to becoming her owners Level 3/4 horse, and I have had a blast developing her using the Legerete! I bred her to the Holsteiner Stallion, Lotus T, and now have a gorgeous chestnut that has been wowing folks all over the country! I frequently have people contact me about the possibility of donating their horse to me. I have had a number of really great horses given to me over the years that I have been able to develop through the levels. After working with the horse I would then decide whether to keep it as one of my personal levels horses or develop it to place with a quality life-long Parelli home. If you have a horse that you are interested in donating, email me with information and I will let you know if I have any openings. At this time I am only considering horses with exceptional qualities.